Wouldn’t it be great if Kids CHOSE to study the Bible on their own? What would it take to help kids make the decision to search for themselves what God wants to say to them through his Word? Below are some of my thoughts that I’ve wrestled with over the past few weeks on this subject. What do you think? MODEL WHAT’S IMPORTANT: Kids learn more of what they see you do than they will ever learn by just hearing what you say. 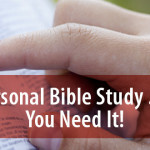 Model the importance of personal Bible study by HAVING ONE YOURSELF. Model the importance of the Bible by using your Bible in front of them at church. Teach the Bible story FROM YOUR BIBLE (not the curriculum) and read Bible verses FROM YOUR BIBLE not just a resource piece. Encourage kids to use their Bibles regularly in class, too. Encourage families to make family Bible study a priority at home. Truth: parents really have the most influence over this… encourage them to be on mission here! MAKE SCRIPTURE INTERESTING: It should be a sin (it might be) to bore kids with the Bible! Bring out interesting and unusual facts and customs. Use all five senses to teach Bible content. Use a variety of teaching methods and approaches to teach kids in the way God created them to learn. BEGIN EARLY: Habits began early in life become life-long habits. Teach kids to treat the Bible with respect. Teach kids that God’s Word is important and eternal. Teach kids that the Bible is God’s letter to them. Read the Bible to kids and encourage families to read the Bible together. Encourage them to read their own Bible with fun and easy “homework” assignments. Follow through and consider appropriate rewards. 4. GIVE EVERY CHILD A BIBLE: How can they study their Bible if they don’t have one? Choose an age appropriate Bible. There are tons of Bibles out there. Find a Bible that meets the need of the child. TEACH CHILDREN HOW TO USE THEIR BIBLES: The Bible is placed on the page differently than any other book they’ve been exposed to. Make sure they know how to use the Bible. Help kids know how the Bible is arranged (Testaments/Divisions). Help kids know how to find book, chapter, verse (I’ve found that must kids get confused about the column found in many Bibles).